Is this product gluten-free – my daughter is highly allergic to wheat and we need to be sure there is no ‘cross-contamination’ (I noticed that Dixie Lily also sells breading products, so the cross contamination is a concern. Thanks! This item doesn’t contain any wheat ingredients in it, however there is small possibility of cross contamination because we currently pack a seafood breader in the same facility as the Stone Ground White meal. 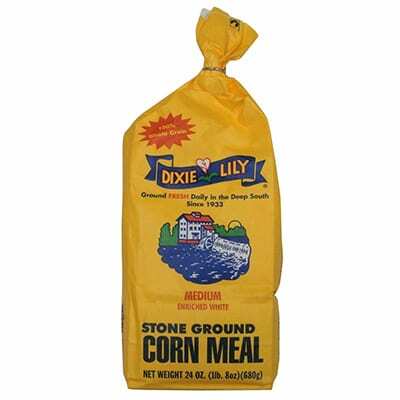 We do have a Dixie Lily Yellow Corn Grit that she will enjoy. Thanks for reaching out. There is no coloring added to the mix. The orange specs that you saw is probably just a mixture of the corn, eggs etc all mixed together. We hope you enjoyed them! I like the ground white corn meal. We are glad that you enjoy it! My local store (Publix) has stopped carrying this item. I make my moms (who has passed) cornbread with the stone ground cornmeal. Can I order it online? You can order our products on line. The website is https://southerntraditionalfoods.com/. However, we would recommend that you complain to your local Publix store manager and request that they carry our stone ground corn meal. We appreciate your business and we hope this helps. I live in London now and just asked family, who live in Atlanta and are about to visit, to bring me a couple of bags. They also said that Publix is no longer stocking it! 😱My mother has always made her cornbread with Dixie Lily. She’s 89 now! I have sent them the link for ordering. Thanks! Is this pre-coked white corn meal?I am trying to make Colombian arepas. Thank you so much for contacting us. Unfortunately, we do not offer a precooked cornmeal? We do not have an arepas recipe so we are not sure if our product would work as a substitute or not. We appreciate your business and we are sorry that we could not be of more help. Is your stone ground white corn meal the whole grain, or is it de-germinated, bleached, bromated, or any such other treatments? We were wondering b/c of the added enrichment listed in the ingredients, which seems to usually be added when ground grains are further processed with such. Thank you for any enlightenment you can share. Thank you so much for contacting us. All of our stone ground corn meals are whole grain with added enrichment. It is not bleached or bromated. We hope this information helps and we appreciate your business. Bless you for responding & bless Dixie Lily for providing this healthy (& best!) option for those of us who love stone-ground, whole grain, white corn cornbread!